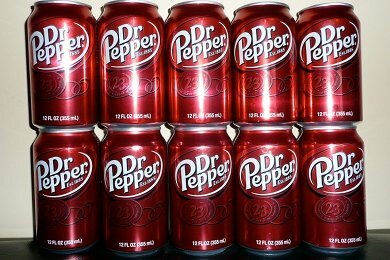 Ten cans of Dr. Pepper is a whopping 1500 calories and the equivalent of drinking 24 ounces of coffee in caffeine. Shawn used to drink this almost EVERY day. The good news is Shawn has kicked his habit, and he shared with us how he did it. I find him to be very inspiring and I hope sharing his story will help others with their soda habits. Ten cans of Dr. Pepper is quite a bit of soda. How did you get to a 10 can per day Dr. Pepper habit? Ten cans IS a lot of soda. And it did fluctuate over the years, sometimes I would make a huge effort and get down to 5 cans a day for a week or so, but it always went back up. Sometimes I'd drink an entire 12 pack in a day. 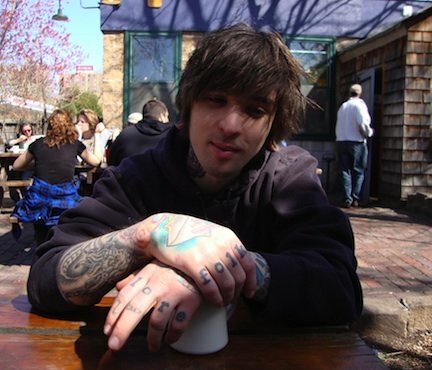 I started drinking multiple cans a day around 14 or 15. My dad drank (drinks?) Diet Cokes all day long, so it wasn't so unusual in my house growing up. I never drank alcohol, smoked, or did drugs, so I kind of focused all of my bad habit energy just into soda. It wasn't till 19, though, that my addiction became exclusive to Dr Pepper and only cans. I would open and drink a can, and not even realize it. There'd be tons of empty cans on my computer desk at home, in the car, and on my drawing desk at work. It was pretty out of control. How did you kick your habit? I'd tried once or twice before, but it never lasted very long. But I was visiting a friend out east, and she mentioned that my intake of soda was gross. I told her whenever she quit smoking, I'd be happy to quit Dr Pepper. It was mostly in jest, but she immediately set the quit date one week out. And I haven't had a sip since. I'm REALLY competitive, so this competition style really worked for me. I did NOT want to lose. Also, I told EVERYONE that I was quitting, so it added a lot of social pressure. That way, I'd stay off the soda just so I wouldn't hear from 100 people how I lost or gave up. On days that you really wanted a Dr. Pepper - how did you stop yourself from drinking a can? There were two big hurdles. The first 3 weeks after quitting was the first hurdle, and then it got much easier. The second big test was when my friend started smoking again, and it wasn't a competition with her any more, but only with myself. I kept myself from drinking them in the beginning just out of determination not to lose the contest. After she started smoking, I kept from drinking them by not wanting to give up. Especially since most people didn't think I could do it, I was driven by proving them wrong. I also had some serious encouragement from my wife and two coworkers. They wouldn't let me whine too much, which was good. I also started drinking sparkling water in cans. I'd love to quit drinking out of cans eventually, mostly for environmental reasons, but for now it's a wonderful substitution. Whenever I get a huge craving, I can still go to the fridge and open a can of bubbly and cold, but without any calories, sugar, or chemicals that soda has. What advice would you give to people who want to give up soda? I think refocusing is the biggest part. I was able to have a contest refocus my attention, but some people are more numbers driven, and like to count the days since they've been "free" or "sober". Set a goal, and don't let any excuses get the better of you. Also, it's gross. Even when I was drinking it, and completely in love with Dr Pepper, I still knew it was gross. I'm vegan, and super healthy, so soda was the last bad habit I had to give up. I just turned 29, and was getting worried about diabetes and all of the other health problems that comes from a horrible over consumption of sugar, chemicals, calories, etc. What is your favorite snack? Toast with earth balance and nutritional yeast.I used to rock poppy seed bagels when I lived back east, but here in the Midwest, there's no good bagels. Here is Shawn's website: Shawn Hebrank Art. Check it out for some amazing tattoo art. If you have a friend or family member with a soda problem, please send this post to them. You might inspire them to give it up -you never know! Please share your soda addiction experiences. Want to read about snacks? My boss has a pretty serious diet coke habit as well- he drinks 5-10 a day! I don't know if anything would make him want to quit though- even turning it into a competition! I need to show this to my husband so he can stop drinking 10 plus cans of diet dr pepper and diet dew everyday! I had the same problem with cherry coke - there is just something so much more delicious about soda in a can... I could drink a 12 pack in a day. I tried "limiting" myself - like I could have 1 a day, but even having it in the house was too much. I'd just drink it constantly. The first step is to not even allow a single can or bottle of soda into your house. After I didn't drink soda for a couple months, I had one at a restaurant, and was glad to find that it didn't even taste good! If you are a sugared-soda drinker, I believe that once you see this visual http://bit.ly/awEpYV - you'll stop drinking that stuff immediately - sugar, sugar. Great story Shawn! I also drank several regular sodas each day until about five years ago. One thing that helped me quit was finally realizing all the bad-for-you ingredients in sodas. When I heard that soda could be poured into a badly stained toilet and the toilet would come clean, I really wondered what it was doing to my insides. This was the real deal breaker. To counteract headaches I was getting by lunchtime because of the lack of caffeine, I started drinking green tea. It has light caffeine and many health benefits and I enjoy drinking something healthy and good. Inspiring! Thanks for sharing! I have a diet soda habit I am working on giving up! The sparkling water was the trick for my husband and me, too. I wasn't a true "addict" of diet soda -- I'd take iced tea or coffee -- but I love the fizz of the carbonation. He, on the other hand, was totally hooked on diet soda for decades -- to both the fizz and the flavor. (Diet Dr. Pepper was one of his faves, but he's caffeine sensitive and the caffeine-free version can be hard to find.) Anyway, after reading Snack Girl's article about diet soda, and doing some other research, he decided to kick it. It's been a couple of weeks and he's down to one soda a day, which is huge for him. I've been buying TONS of unsweetened naturally flavored seltzer water or plain sparkling water and it's really helping him make the change!